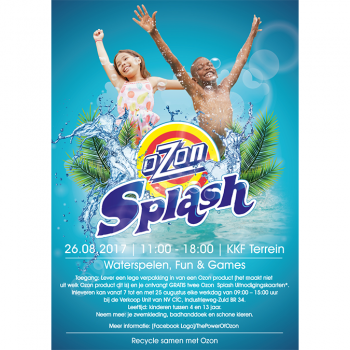 On Saturday the 26th of August CIC will be organizing OZON SPLASH, an event especially focused on its customers. On this day, KKF will be completely transformed into a water themed park suitable for families with children aged 4 – 13 years. OZON SPLASH is characterized by the many water attractions such as swimming pools, water slides and foam baths. But ... There's more. During the event, children can exercise, experiment in the Science Lab, learn how to recycle and the older children will be able to solve an interactive puzzle in a creative way in the so-called Escape Room. With OZON SPLASH CIC aims to make an important contribution to raising awareness of keeping your environment clean. In order to gain access to the event, visitors must hand in OZON packaging materials at the special drop-off points prior to the event. In return, the visitor will receive an invitation card. The collected packaging materials are recycled in cooperation with N.V. AMRECO and reused in a creative way during OZON SPLASH. Empty OZON packaging can be exchanged from the 7th to the 25th of August, every working day between 09:00 and 15:00 at the sales unit of NV CIC, Industrieweg Zuid BR-34, Paramaribo. Follow all updates around this event via: http://www.facebook.com/thepowerofozon.